HomeBlogGeneralIs Diwali the Most Expensive Festival? Revisiting the tales of Ravana, discussing safety and distributing sweets are few things that we do every year during Diwali. This time around, let us explore how Diwali has grown into a contemporary festival at the global level and the impact it has on the Indian economy. Lights, Action and Selfies – Diwali has arrived! Diwali is India’s most elegant and cosmopolitan festival –thanks to the irresistible sweets, the evolving fashion and the innovatively designed crackers. While Diwali has a strong cultural background and stands as a strong proof that good always wins over evil, the festival has clearly picked hues of style and sophistication over the years. With Diwali comes multiple environmental, social and psychological changes that together cause a major impact on the overall economy of the country. To start with, Diwali sets the entire country in a festive mood and the joy of Diwali spreads like a ripple effect throughout the Indian economy. In the recent years, the Indian IT sector has taken to celebrating Diwali in a grand manner. With millions of hardworking, brilliant youngsters finding solace in their jobs, it is only fair that companies take up the effort and time to celebrate with their employees. In 2015, Google added a touch of goodwill to its Diwali celebrations by using “terracotta diyas” made by autistic children. Grand decor adorned the office building and special lunch was served to all employees. E-commerce giants like Flipkart and Jabong celebrated their grand festive season sales by commemorating the loyal employees during the Diwali celebration. Other companies like Ernst and Young, Snapdeal, Times of India, GiftXOXO and Interface where among the top most companies that celebrate Diwali in an extravagant manner. 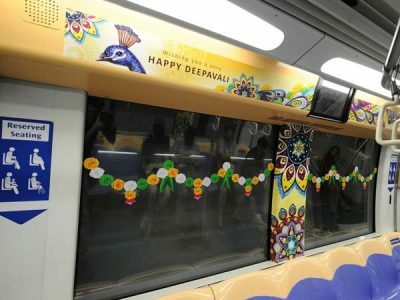 Just when you thought, Diwali celebrations have reached until the doors of the corporate; Singapore launched its exclusive Diwali-themed train earlier this month. 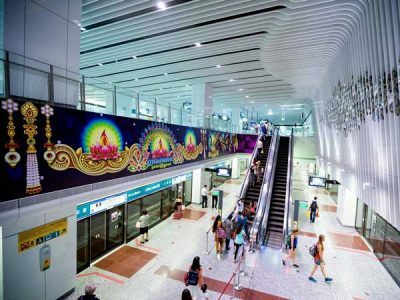 Known to be the second home for Indian Tamils, Singapore has always been a pioneer in embracing Indian festivals. This year, the country moved one step ahead of the usual and established this remarkable feat. London is celebrating Diwali with colorful performances and parades at the Trafalgar square. 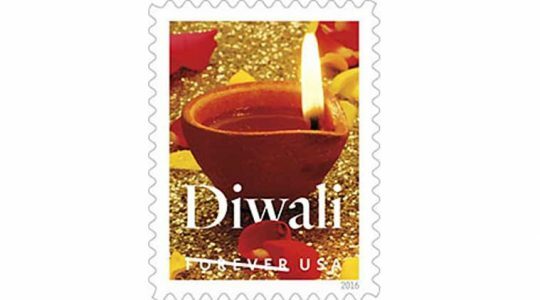 In order to commemorate the beautiful Indian festival, the United States of America launched a Diwali special Forever stamp. Amidst all this grandeur came a ray of hope when Pakistani forces and the Indian Army exchanged sweets at selected border stations. The ceremonial exchange of sweets made the troops as well as the people of both countries feel warm in spite of the many years of strained relationship. E-commerce websites that offer fashion, electrical appliances and furniture have shown a tremendous increase in sales. While brick-and-mortar firms have always reported increased sales during the Diwali season, trade through digital media is quickly catching up. The boycotting of Chinese products has led to 30% decline in the Diwali sale of Chinese goods across the country. Five new cars have been launched during this festival sale. They are Renault KWID AMT, Tata Kite 5, Maruti Suzuki Ignis, All-new Toyota Fortuner and Hyundai Grand i10 Facelift. Many banks are also giving coupons and 10 to 15% discounts on the purchases made with their debit or credit card. This year, Citi bank is giving Rs.7000 cashback for purchasing newly launches iPhone 7 using their cards. While gold prices go up the radar due to high demand around Diwali time, this year has been an exception. A strong US dollar and the probability of rate hike from the Federal reserve of the United States has caused immense pressure on the gold price. The market for idols made from luxurious metals and precious stones seems to be on the rise. Different models of Lord Ganesha and Goddess Lakshmi with price ranging between few thousands and few lakhs are growing in demand among the elite group. In 2015, Snapdeal reported 500-crore worth of mobile phones only during the festive season. This year online sales are expected to rise from 9000Cr to 10000Cr comparing last year sales. Flipkart recently conducted a five days Diwali sale which was ended up with 15.5 million units sale worth of $500 million. Automobile companies like Honda experienced the highest sale period during Diwali and so did Micromax, a leading player in the mobile phone and LED television market. In general, almost every industry in India showcased a positive growth through the Diwali season and those who adeptly took advantage of the opportunity expanded their market share considerably. This year, Diwali began with the most typical data confusion saga and yet the festival of lights did not fail to create an upbeat ambience among Indians and the enthusiasm will have a direct effect on the spending intentions of the consumers (in 2015 India was declared as the country with the highest Consumer Confidence and Spending Intention by the Nielsen Global survey). Business owners and traders will stop focusing on increasing the demand but will instead take the effort to satisfy customers by delivering the right merchandise at the right time and at the right place. This leads to increased hiring across several industries such as logistics, marketing, manufacturing, digital media and so on. More money is sent in and out of India during Diwali and imports reach a new high every year. The overall business growth is propelled and movement starts with the mind and attitude of every single consumer. “The consumers will spend 40% more on this ongoing festival sale compared to last year” , says ASSOCHAN survey. An averagely upper middle class family spend around Rs.15000 to RS.25000 during the Diwali season. Diwali is the time of the year when the entire country moves into a shopping spree and the overall economy of the country is on a high. Government lays restrictions on the noise pollution and air pollution caused by the excessive use of crackers (SAFAR reported an intense change in air quality after Diwali 2015 celebrations). With a strong sense of safety and environmental-friendliness, Diwali can turn out to be the best time for economic growth and personal glory for the Indian population. Diwali is basically an Indian festival but it recent years it has been celebrated and cherished by most of the countries. really a very good post about Diwali. I simply love it.